I’ve been a journalist for more than 50 years. The first 15 years as a sports writer/editor for Copley Newspapers in California. I covered both the Dodgers and Angels. This photo was from an interview I did with Sandy for a Copley magazine. I graduated from Windham High in 1959 and lettered in baseball and football. I remember the family well. My Dad, Stan Sr., was head of umpires in Willimantic for years and used to umpire games played by the Elks team when Walt Dropo and his brother Milt played for them before Walt signed with the Red Sox. Stan, Thank you so much for the back story on this picture. This site is a labor of love and comments like these help me keep going! 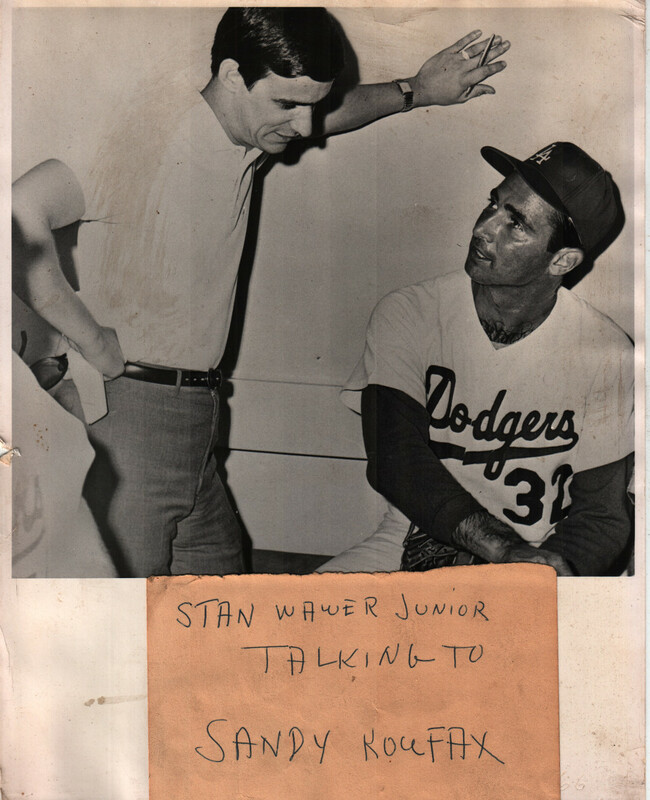 My Uncle Alfred “Sonny” Saba has told me all about his days playing baseball with Walt, Milt and others. From his and my Father’s stories it sounds like it was a great time to be a kid!! Unfortunately the sports/athletic gene skipped a generation with me but my son seem to have it. He is heading to college in another year and a half and is trying to decide if he wants to try out for the baseball or hockey teams. I’m not planning on him playing professionally but I love his commitment and drive to always be a better athlete. My rule is we can have an athlete in the house but not a jock! Thank you again for the comment, the information and the memories. And, if you want to write anything else especially related to sports in Willimantic I’d love to post it.